One of my favorite tools for excavating human story and motivation is the Noteboard. A good brainstorm needs a wipe away tool and short of toting a large dry-erase board around, the Notebook is ingenious. It opens up to 35”x15” and is divided into note size sections and includes a marker with an attached eraser. Contained within a machine-washable pouch that acts as another eraser, any sleuth can simply wipe away any monster, zombie, alien, or downright malevolent foe. 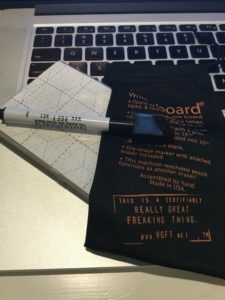 If you have an idea, a story, or just like wiping the slate clean, The Nobeboard is available at https://thenoteboard.com or Amazon.